Deadlines. Orientation. Housing. Registration. Somehow, it all comes together. Now the Wolfpack’s latest first-year class has landed on campus, coming from 95 North Carolina counties, 38 states and 23 countries. 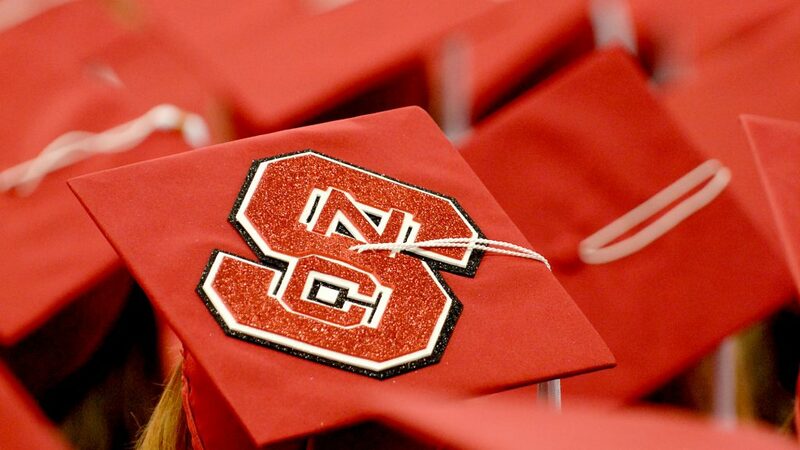 Say hello to the largest and most academically qualified class in NC State’s history. They’re already setting new benchmarks left and right. With a record number of applicants for the 2018-2019 academic year — and transfer applications also reaching a new high — NC State received more applications from North Carolina students than any other public university in the state. Explore the impressive stats racked up by our incoming class. And get to know some extraordinary individuals behind the numbers. When Niambé James was in fifth grade, she took a trip to Sierra Leone that sparked a lifelong interest in sustainability. “I visited a number of beaches, and all of them had two things in common: picture-perfect white sand and an abundance of plastic waste,” said James. Although many schools have environmental science programs, “only NC State offers sustainable materials and technology, which encompasses exactly what I’m passionate about,” she said. NC State is the best school for my major. James hails from Clayton, North Carolina, and she’s looking forward to spending time on a bigger campus with a diverse student population. As one of 50 Goodnight Scholars chosen for the class of 2022, James is excited to expand her horizons while pursuing her passion. “From service trips to study abroad opportunities, being a Goodnight Scholar will expose me to opportunities I never imagined in high school,” she said. 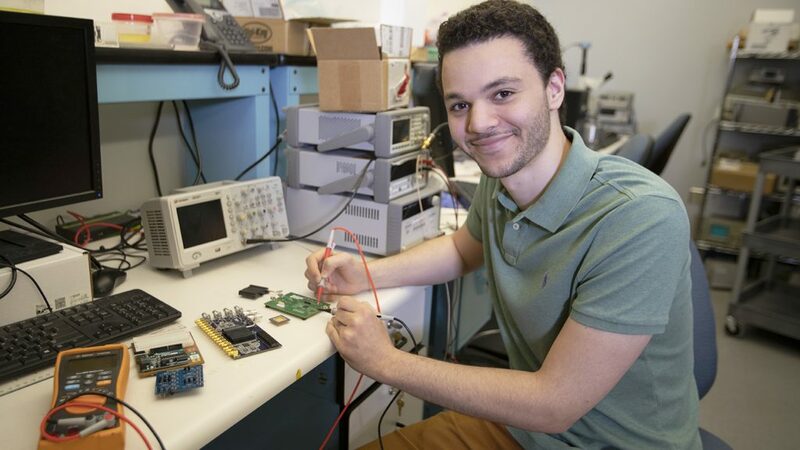 First-generation college student Daniel Toole knows firsthand what it means to reap the benefits of a strong community. And as North Carolina FFA state president, he’ll cultivate communities from the mountains to the coast. Toole travels across the state and the country facilitating workshops and preparing students to become better leaders where they are, with what they have. I’m excited to become part of one unified Pack. Now he’s finding his place in NC State’s community. The Brevard native is a Park Scholar who plans to study biological sciences and serve as a state FFA officer. “I’m excited to become part of one unified Pack, where I can take risks to intellectually grow while still having a community to support me,” he said. When Ares Epps was in high school, he wasn’t the only person focused on his track career. NC State assistant track coach Chris Seaton took an active interest in Epps’ progress. I’m here to break my personal records. I want to be the best student and best athlete I can be. For this student-athlete, getting started early made good academic sense. Epps participated in Summer Start and got a few credits under his belt before the semester — and daily track practice — swung into full gear. 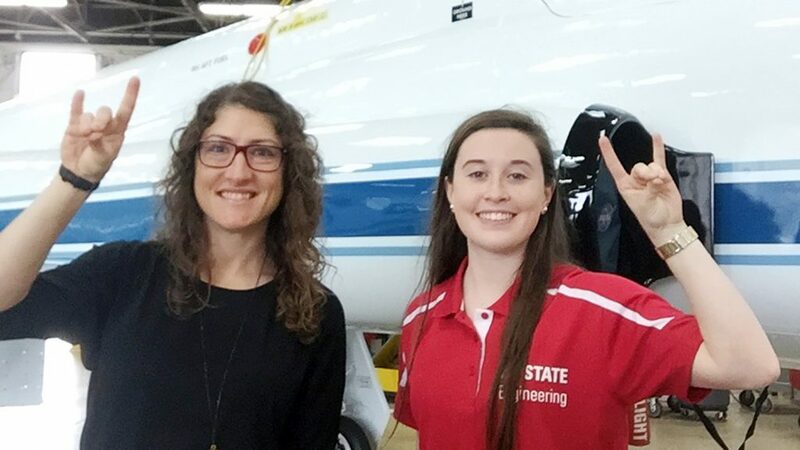 “After her talk, I knew immediately that I wanted to be an engineer,” said Coan. Now she’s embarking on a biomedical engineering degree, with dreams of designing prosthetics for veterans. But that doesn’t mean Coan is letting her other passions fall by the wayside. In fact, she chose NC State so she wouldn’t have to. That’s a reason why I chose NC State: They emphasize being a well-rounded person. In high school, Coan spent her free time winning poetry recitation contests or competing with her all-girl robotics team. Now, staying on track in her first year of college, she’s readied a list of theater classes she plans to take, and she’s found a like-minded community of women in STEM at WISE Village. That focus on balance — between arts and science, between academic and personal fulfillment — is what led Coan to select NC State above other schools she considered, such as Georgia Tech. With her bucket list already in hand, Alex Tobey had toured the Belltower before most of her classmates set foot on campus. And that’s not the only way she’s jumped headfirst into life at NC State. Her first leap was making the move from her small hometown of Hawley, Pennsylvania, a borough of about 1,200 residents. NC State exceeded all of my expectations. Tobey was eager to kick off her college career following a two-year gap after high school. And thanks to Summer Start, she was able to begin working on her animal science degree early. While knocking out coursework, she also got a head start plotting out her time at NC State. She’s cultivated close relationships with faculty and classmates, and she worked closely with her advisor in the College of Agriculture and Life Sciences. For now, Tobey has her sights set on NC State’s highly ranked College of Veterinary Medicine for her next step after graduation. Micah Holdsworth researched his college options carefully. After growing up in Antalya, Turkey, uprooting and coming to the U.S. was a big move. He chose NC State because its nationally accredited architecture program will allow him to pursue his passion for environmental design and sustainable building. “I’m interested in being a good steward of the natural world through design,” he said. I fell in love with NC State during my spring visit. The people were a big part of it. Service comes naturally to Holdsworth. During high school, he partnered with others in his community to help provide Turkish lessons and other resources for Syrian refugee children. With an intensive program ahead of him and the added commitment of a Park Scholarship, he’s hoping to roll two immersive programs into one great college experience. “Like a lot of students, my biggest apprehension is time management,” he said. Still, he’s eager to meet the challenge. First-year life sciences major Kelci Cox doesn’t consider herself to have a hometown. After being born in China, she was adopted into an American family in Arizona. Her family moved to Düsseldorf, Germany, when she was six, and then to Shanghai, China, and back to Germany. I love the campus, and the atmosphere makes me feel at home. As a Park Scholar, Cox says the program’s strong sense of community provides a vital source of support. In fact, she has a history of creating community for herself and others wherever she goes. If you can see yourself here, take a look at our admissions process and the many paths to NC State. During high school, Cox started an art program for children at a refugee camp to help them feel more integrated into the community. “I knew they were scared because they had to leave everything behind, so I created the program with the hopes that they could have some time to enjoy just being kids,” she said. I am a proud 1973 graduate of NC State, but this article makes me even prouder of what my university has become and is becoming, which is a genuinely world class school with amazing students! I’ve always been intrigued by diversity and to see this much diversity all on one campus has me excited to apply to this school! Can’t wait! I visited NC State recently and after reading this article, I can’t wait to apply. My son looked at 7-10 colleges all over the state from one end to the other large and small. We live in Raleigh about a 1/2 mile from NCSU and I worked there and he is an legacy kid. We thought wow he should do something else and go somewhere else. He toured textile chemistry and technology and was hooked. Now a first year Honors College student majoring in textile technology he couldn’t be happier and I can’t believe we tried to get him away from here! Taking a look at this class has made me want to push myself to be better. It’s amazing what these students have done and accomplished. NC State is a college that has my priority and is definitely my first choice and dream school. Coming from rural Johnston County, it would be nice to live in the city. NC State is an amazing school and I cannot wait to apply! Wow! What a diverse, smart class! Each student has their own unique offering they bring to the table, and their passions will help to make a better tomorrow for all of us. Go Pack! After looking at this class I believe I can do the same as all the great people in this 2018 class. Each of them are unique in what they are passionate about, where they are from, and what they plan to do in life. Once I finish Early College, I want to transfer here but I feel like I haven’t done enough. I want to get more involved so that I can get the full experience of this great school! What an interesting class. Congratulations, Dani Coan on your choice.Each choice has consequences. I can change the world———-one choice at a time.Rev. Jim Gaither . Looking forward to great things.